In the expression of (a + x)n, the coefficient of second term is nC1, of the third term is nC2, of he fourth term is nC3 and so on. The suffix in each term being one less than the number of the term to which it applies; hence nCr is the coefficient of the (r+1)th term. This is called the General Term, because by giving different numerical values to r any of the coefficients may be found. Also, the indices of a and x in the (r + 1)th term are expressable in terms of r.
Tr+1 = nCr an-r xr = ((n(n-1)(n-2)....(n-r+1))/r!) an-r xr. Note: General term is useful in finding the following in Binomial expression. (c) Term independent of x. (d) Term containing the greatest coefficient of x. Find the fifth term in the expansion of (a + 2x3)17. Tr+1 = nCr an-r xr. T5 = 17C4 a13 (2x3)4. Find the term independent of x in (1 + x + 2x3)  ((3/2)x2 -  (1/3x))9. We want to find the term independent of x in product of (1 + x + 2x3) and  ((3/2)x2 -  (1/3x))9 . So, we should find the terms containing x0, x-1 and x-3 in the expansion  ((3/2)x2 -  (1/3x))9  and multiply them respectively with the appropriate term from (1 + x + 2x3) i.e. constant term i.e. 1, term containing x i.e. 1 and the term containing x3 i.e. 2.
so coefficient of x0 we use (-1)6 9C6 3-3 2-3 = 9C6  (1/22.33). (ii) To find the term containing x-1 we use 18-3r = -1 i.e. r = 19/3 ( I) which is impossible. (iii) To find the term containing x-3 we put 18-3r = -3 i.e. r = 7. So, coefficient of x-3 in ((3/2)x2 - (1/3x))9 = (-1)7 9C7 3-5 2-2 = -9C7  (1/23.35) . Therefore, required coefficient = 9C6 (1/23.33)× 1-2 × 9C7 (1/23.35) = 17/54. Find the coefficient of x24 in  (x2 +3a/x)15. => 3r = 6 => r = 2. Therefore, the coefficient of x24 = 15C2 9a2. If the binomial co-efficient of the (2r + 4)th term and the (r - 2)th term in the expansion of (1 + x)18 are equal, find the value r.
The coefficient of (2r + 4)th term in (1 + x)18 = 18C2r+3 and the coefficient of (r-2)th term = 18Cr-3, so that 18C2r+3 = 18Cr-3. If the 4th term in the expansion (px + 1/x)n is independent of x, find the value of n. Also calculate p if the 4th term is 5/2. Here T4 = T3+1 = nC3(px)3 (1/x)n-3 = nC3 p3 x6-n.
T4 is independent of x => 6 - n = 0 or n = 6. Now given T4 = 5/2 => 6C3. p3 = 5/2 => p3 = 5/2 . = 1/8 => p = 1/2. If the expansion of (1 + x)43 the coefficient of (2r + 1)th term is equal to the  coefficient of (r + 2)th term find r.
Given in the expansion of (1 + x)43 the coefficient of (2r + 1)th term = the coefficient of (r + 1)th term. or 2r + r + 1 = 43 => r = 14. Find the coefficient of x3 in the expansion of (1 + x + 2x2) (2x2 - (1/3x))9. => coefficient of x3 is 9C5.24 (-1/3)5 = -224/7. 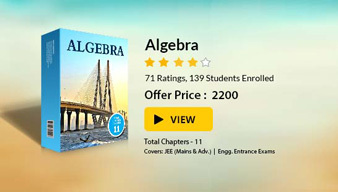 To read more, Buy study materials of Binomial Theorem comprising study notes, revision notes, video lectures, previous year solved questions etc. Also browse for more study materials on Mathematics here.